Kimberley Karlshoej is the Head of the Seafarers’ Trust, she is the woman who tried and escape the maritime industry but was pulled back into the maritime world when the TK Foundation was founded to honour her father, J Torben Karlshoej, who founded the Teekay Corporation, when he passed away. 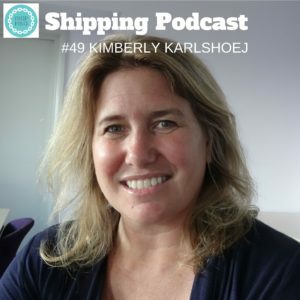 Listen to Kimberley talk about what it encounters to be the Head of the Seafarers’ Trust and all the exciting projects that they are doing right now. Portable Communication Pods Pilot Project, or the autonomous meeting place, with free wi-fi, which allows the seafarers to access communications themselves in a way that they might not been able to do otherwise. They work on games for making things fun and easy to learn and many more exciting things that I found out by talking to Kimberley. We speak about the survey that the Trust has done among seafarers, which shows that internet is the number one concern of seafarers and they do say that it will affect their jobs they chose in the future, whether or not there is internet onboard. Listen to this 22nd female guest, of 49 episodes in total, and let me know what you think. You are welcome to comment on iTunes, below or in social media, where you find the Shipping Podcast on Facebook, Twitter and Instagram.